There is so much activity in Paris that I wanted a postcard taken with my camera of a lively scene on a Saturday afternoon. This is my souvenir picture (taken in May) showing what I observed during a drive through the city. This entry was posted in France, Paris, Travel and tagged bridge, postaday, postcard. Bookmark the permalink. Love all the activity along the Seine………..ah what a pleasant afternoon it would be! It is such a delightful way to spend an afternoon! 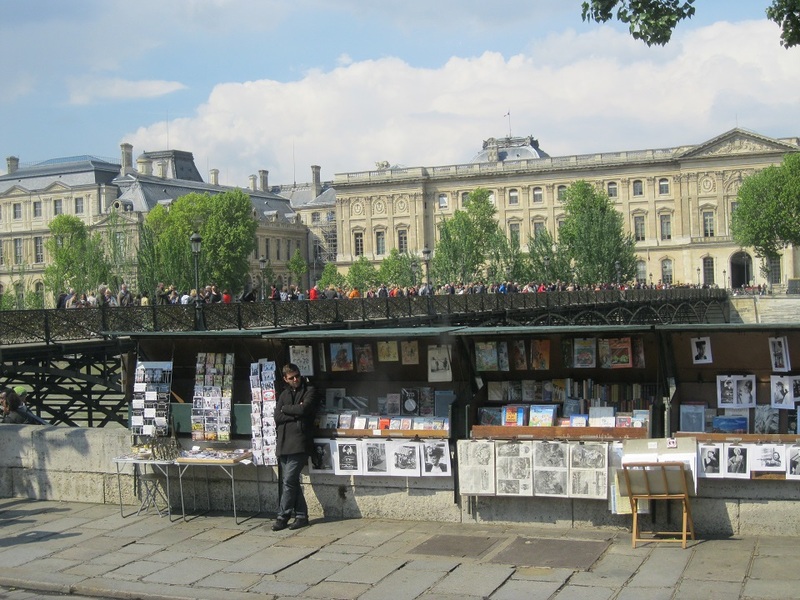 Thank you – walking along the Seine is a wonderful thing to do! Pingback: Weekly Photo Challenge: Street Life (Apartments) | What's (in) the picture? I also noticed all the people on the bridge! There were so many people on the bridge I wondered where they all were going! Perfect! I love street art. Paris is one of my favorite places too – I thought this scene made an interesting postcard! Nice shot. You have the street life, and the grand architecture in the background–and obviously a beautiful day, weather-wise. Love your header image. Thank you Patti – it was one of my favorite scenes from Paris! What fabulous shot and a lovely souvenir Meg. I like it! Wish I were there. Thanks and I know what you mean – I’d like to be there too! Love those bouquinistes! Great shot, Meg! They really are marvelous – thank you Patricia! Thanks Brad – it’s really nice to hear from you! I bet that guy selling pictures wishes all those people on the bridge would walk past his stall. Nice entry for the challenge. So nice to see a sunny day on the Seine, Meg. I’d love to stroll along and take it all in! It was a beautiful day and I’ll always remember it. Paris is really gorgeous! It’s a wonderful thought – simply delightful! What a lovely place for a stroll! It is so nice when there’s no rush and strolling is just about perfect! Temptation keeps being dangled in my path, Meg :) Just yesterday I picked up Edward Rutherfurd’s ‘Paris’ in the library. I think I might just have to visit. I agree – it’s what makes Paris so wonderful! Great Parisian scene! I lived there for 3 months one spring while doing research and loved being a Parisienne for a short while. Have just found your blog and noticed you’d been in Edinburgh – was so sorry for your cold and damp Tattoo experience. Yes, locals would always take warm clothing, waterproofs, waterproof rug and seat cushion for the Tattoo. I could have lent you some kit!